We believe that yoga, mindfulness, and music are tools for raising the vibration of love in our body, breath and brain as well as our community and in the world. The Newtown Yoga Festival was formed as a holistic solution for anyone and everyone through the transformative wisdom and practice of yoga. It is our way to honor lives lost, celebrate the strength and resilience of humankind and offer healing with a compassionate practice and conversation on peace. The festival has been designed to promote positive well-being, health, and community. Yoga, by promoting movement and mindfulness, has been proven effective in reducing stress and depression and is a valuable mechanism for coping with physical and emotional trauma. The Newtown Yoga Festival honors this ideal. Please join us on August 25th from 9:00 am to 12:00 pm for a heart-opening, vibration-raising experience that will revive your spirit, enrich your practice and activate the power of love in your life. 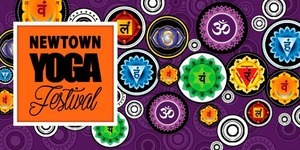 The Newtown Yoga Fest is part of the Brainstorm Experience, the local effort of The Avielle Foundation whose mission is to prevent violence and build compassion through research, education, and community.